When I was growing up, I was one of those kids who liked to rearrange the furniture in my dollhouse and remodel it more than I liked actually playing with the family that lived in the house. When playing The Sims, I’d rather build the houses and venues than play with the characters. Why? Because for me it’s more fun to build something than it is to do the “work” of living in it. Let me build it, tear it down, and start again to make it better and I’m a happy camper. Don’t clutter the building experience by making me gather resources, manage people or time, or earn an income. Among the Stars is a game that satisfies this urge to build without making you do the dirty work of also living everyday life in what you’ve built. 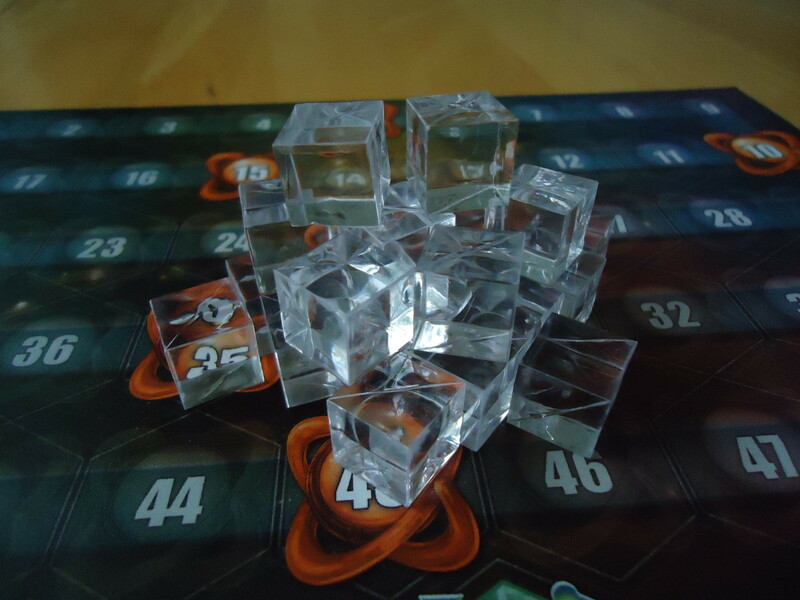 It may be the perfect game for those of us who just like to construct stuff. Among the Stars takes place in a time of peace in the galaxy. War-weary alien races have established an alliance to build space stations throughout the galaxy in an effort to improve diplomacy, trade, and defenses. 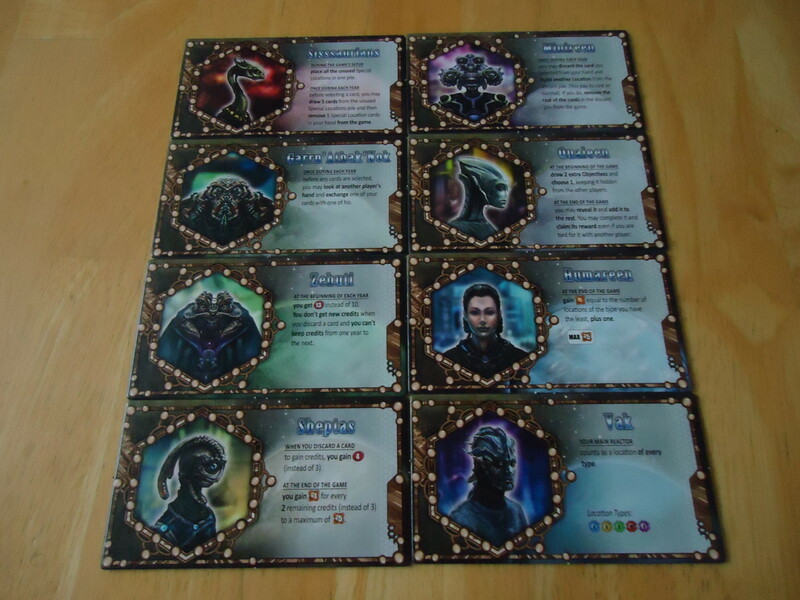 Each player takes the role of one of these alien races and attempts to build the greatest, most efficient space station that will promote some or all of these objectives. 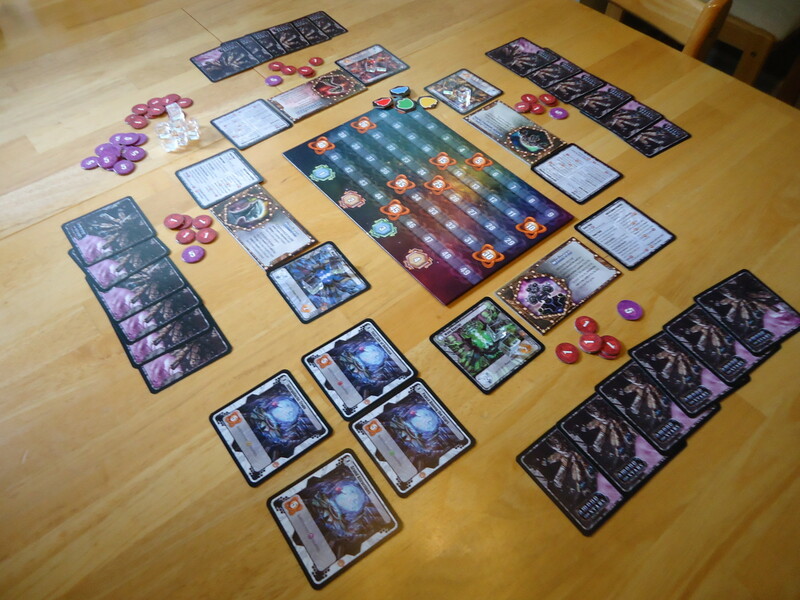 Among the Stars is played over four rounds with each round consisting of six turns. At the beginning of a turn, you select a card from your hand and place it face down in front of you. Your remaining cards are passed to the appropriate player. The cards you receive will be your hand for the next turn. Once the card draft is complete, everyone reveals their card and simultaneously takes their turns. Build a location. You can build the card that you kept during the card draft. You must pay its cost in credits and energy cubes (if applicable) and adhere to the card placement rules. After you build the location, you immediately receive the amount of VP’s shown on the card. The location may also provide a special ability. Some abilities are enacted immediately upon building the location, while others are delayed until the end of the game. Build a power reactor. The power reactors generate the energy cubes needed to power other locations. To build a power reactor, you first discard the card you kept from the draft and then pay the cost to build the reactor, instead. The appropriate number of energy cubes are placed on the reactor and then “paid out” on subsequent turns to power/pay for other locations. Discard and gain 3 credits. If you can’t or don’t want to do anything else, you can discard your card and take three credits from the bank. At the end of a round, stations are checked for errors and adjusted to bring them back into compliance with the rules of card placement. Victory points are adjusted accordingly and then another round is set up. The game ends when the fourth round is over. In addition to the points already earned for completed builds, points are added for any completed objectives (if you’re playing with that option) and delayed special abilities. Additionally, players gain 1 VP for every power reactor that does not contain any energy cubes and 1 VP for every 3 unspent credits. The player with the most points wins. Among The Greats or Lost In Space? The joy of this game is the many ways you can change the difficulty and complexity without buying any of the available expansions. The designers were generous and included a lot of options in the base game box. You can choose to add alien races, which invoke special abilities. Or add objectives, which give you extra points at game’s end if you’ve achieved the objective. Each of these increases the complexity of the game a little bit, but not in such great leaps that it ever becomes unwieldy. Even if you’re playing with everything included, games still take around thirty minutes. If you want more “take that” in your game, you can play in aggressive mode. In this mode, if another player targets you with a dispute card and you fail to meet the condition on the card, you lose victory points while your opponent gains points. This adds some interaction to the game but it can get a little mean if players target the same person over and over again. For those who don’t love conflict in their games, this is best left out. You might think that playing in non-aggressive mode would be nothing more than multiplayer solitaire. It’s not. While it is possible to get lulled into just building your own station without noticing what the other players are doing, this is a mistake. In addition to building your own station, you want to keep an eye on what other players are building, too. You don’t want to pass them cards that will allow them to score big, after all. It may even be advantageous to discard a card entirely so that they have no chance to get their hands on it. The game plays well at all player counts, although the rules differ slightly with two players. You use two “virtual” players. They are really only used in order to make the card draft work properly. The only other change is that if you’re playing with racial abilities and the ability allows you to interact with another player’s hand, you can use that ability on the virtual players, too. Everything else plays normally. As “dummy players” go, this variant isn’t too bad. You don’t have to control a meeple throughout the game, or do anything other than pass cards to/from the dummy. This makes it much simpler and less fiddly than the dummies found in games like Alhambra, Fresco, or Pergamon. I’ve never found the dummies in those games to be onerous to play with, just a little fiddly. If you’ve played and liked those games with two players, Among the Stars will be very enjoyable to you. If you want to skip the dummy aspect altogether, there is an alternate set of unofficial two-player rules included. (Since they’re in the rulebook, I would consider them official, but they were proposed by a BGG user and added to the rules in later editions.) I found both rulesets to work well, so it’s a matter of preference. Among the Stars is a simple game wrapped in an elegant shell. We played with some non-gamers and they were a bit intimidated at first. When all the different cards came out of the box, they freaked out a bit. 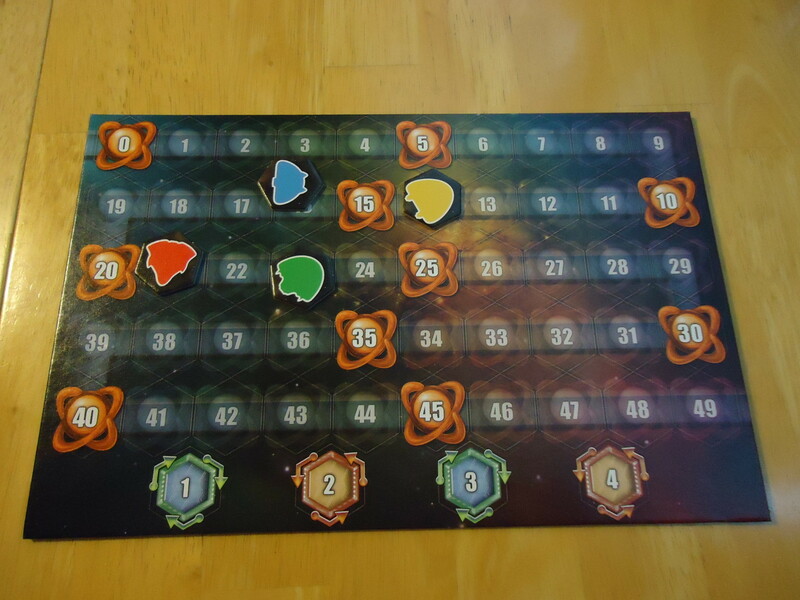 It can look a bit intimidating and the iconography can take a few games to fully internalize (but it’s still much easier to learn than Race for the Galaxy, a game to which Among the Stars is often compared). But once we got them playing, one said, “That’s it? This is easy.” And it is easy to play. But it’s not easy to win. You have a degree of freedom to build what you want (as long as you adhere to the placement rules) but thanks to the card draft, you never know which pieces you’re going to have to work with. 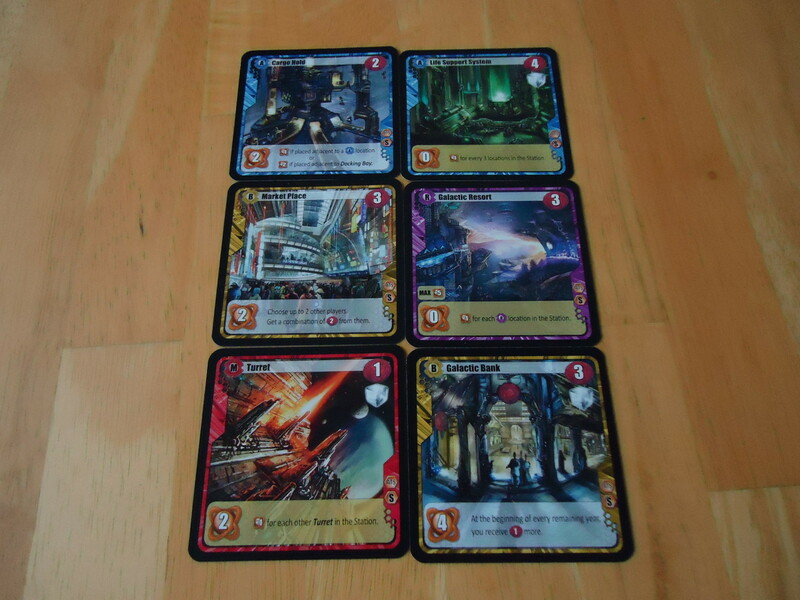 After several plays to familiarize yourself with the deck, you can know to some extent which cards remain available. Looking around the table at what other players have played will tell you what’s still in the deck, but you have no way to know what you might get. You are trying to plan several moves ahead, but your planning ability is limited. There are lots of ways to score victory points and create an efficient build. Some locations reward you for building more of them, but maybe you want to use one that gains a lot of points right now, rather than hope for more of those other locations later on. Or maybe you build something that doesn’t score many points upfront, but does have a big payoff at the end when delayed abilities are considered. There’s a lot to consider and choosing amongst the options can sear your brain a bit. The more of the included options you add to the game, the more brain burn you might experience. Even so, AP isn’t really a problem here. I found that if it’s going to happen, it happens during the draft as players try to choose the best card for themselves while keeping other good cards away from other players. Once it comes time to build, you only have one card to work with so your options are limited. I liken Among the Stars to doing a crossword puzzle. Everything can be going along great and you’re thinking you’ve got it beat but if you get one letter wrong, the whole rest of the puzzle goes to pot until you figure out where you went wrong. That’s sort of the way Among the Stars feels. Everything is going great until you place the wrong card in the wrong place. You can end up boxing yourself into a situation that is difficult to get out of. The neat thing is that you do most of the damage to yourself. If you’re not playing with the disputes, no one’s helping to wreck your plans (other than maybe noticing which cards you need and trying to withhold them from you). You’re mostly in control of your own station. To do well you need to pay more attention to other players than you do in a game like Cities, for example, but you generally have more control over your fate than you do with some games. If you prefer to live and die by your own sword, Among the Stars is a game for you. The only thing I found bothersome about the game is the need to constantly check your builds for errors. Due to the nature of the game and the rules of card placement, it’s pretty easy to accidentally place a card in an illegal space. This is why builds are checked at the end of a round and points/builds are adjusted accordingly. This can be an annoying process, especially if you’re found guilty of an illegal build. Those points you thought you had can vanish and the great station you thought you were building can be seriously disrupted. Of course, this can be prevented by making sure you never place anything illegally, but the level of vigilance required adds time to the turns. It’s not overly burdensome, and similar to the same level of checking that’s required in a came like Cable Car/Metro, but it’s just about the only negative I found in the game. I have to add a bit about the overall experience of playing this game. I mentioned above that this game satisfies my urge to build, but it goes a bit deeper than that. The artwork in the game is great and very evocative of what you’re building. (Some rooms even have aliens in them having meetings, watching holograms, or going about other aspects of their daily lives.) It’s very easy to see how each location relates to the others and at the end you’re left with something you can easily imagine your aliens living and working in. It makes you determined to do better for them next time. It’s almost like you’re laying out the blueprints for a station that might one day be built. But the experience doesn’t stop there. The designers were kind enough to include a bit of backstory in the rulebook. It’s not long or terribly detailed, but it’s a nice touch that immerses you a bit more in the theme of the game. The biographies of each of the races are also entertaining. All in all, it creates a fun game and a chance to make up some stories of your own, if your group is into that sort of thing. I’ve heard people knock the game for being too abstract or having a pasted-on theme, but I don’t find this to be the case at all. I find the whole package to be entertaining. If you’re looking to control your aliens’ lives and delve into the experience of managing a space station on a day-to-day basis, this isn’t the game for you. But if you just want to build space stations, tear them down, and try to do better next game, Among the Stars is a winner. 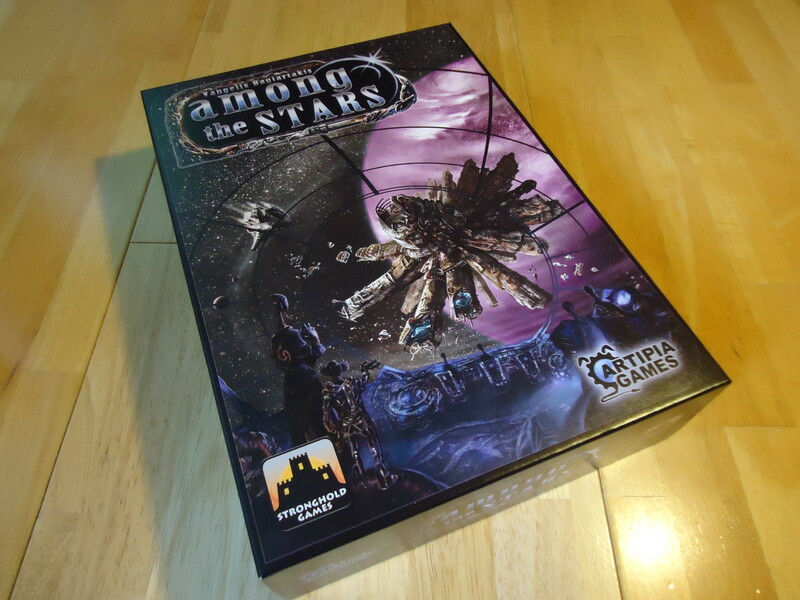 iSlaytheDragon would like to thank Stronghold Games for providing a review copy of Among the Stars. Game can be played either aggressively or peacefully, depending on preference. Scalable complexity level makes it suitable for gamers and non-gamers. Simultaneous turns means that play moves quickly. Lots of replayability when you factor in all of the different ways that locations, objectives, and races affect how you earn VP's and form strategies. Gorgeous artwork and evocative theme feel like you're building a space station. Two player version requires management of dummy players (unless you try the included 'unofficial' 2p rules). Iconography can be a bit confusing at first. Easy to make scoring errors so you have to check and double-check everything. Requires a lot of table space, unless you play with the 'Limited Space Variant' included in the rules.